Bestie's Wedding? Here's All That *You* Should Be Paying For! Your bestie must have spent months, even years planning her dream wedding. Imagine having to go for numerous lehenga trials, scheduling meetings with wedding vendors, all while sticking to a strict budget. And in between all that madness, you (as a bridesmaid) certainly don’t want to add to the budget strain. As your bestie's bridesmaid, here’s all you need to know about the finances of a wedding. Curtly put, all the things you are expected to pay for and where you shouldn’t have to. This is a night planned by the besties of the bride and she cannot be contributing or paying for the same. You along with the other bridesmaids need to get together and execute the plan accordingly. If your stay has been booked at a hotel for the wedding, then the laundry and steam ironing of your outfits is on you. Some hotels include steam ironing of a few pieces in their package but beyond that, you need to pay. Also, all room service bills and consumption of the mini bar is not on the host and should be paid by the guests. If your bestie has planned a destination wedding then the airfare is on you. It is advisable that you book your tickets as soon as the date and destination is finalized. If it’s a destination wedding and you plan to reach a few days earlier or stay back for a few days after the wedding, then it is only fair, that the tariff should be paid by you. If your bestie has included your make-up and hair in the package then it’s fine. Otherwise, you need to pay for the same. What should she be paying for? For a destination wedding, the stay during the wedding functions is always on the host. No questions there. 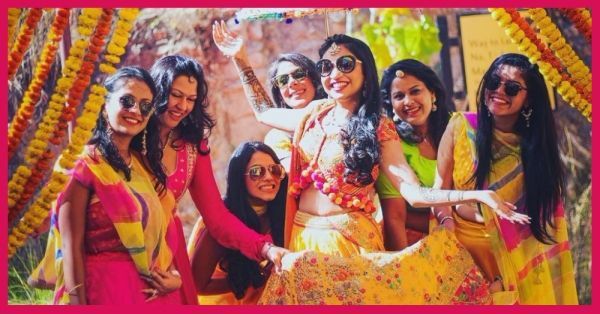 If your bestie wants all her bridesmaids to be wearing a ‘banarsi’ dupatta or a ‘bandhni’ saree, then these products can be a gift from her. Although, you would have to get your own outfit stitched according to her specifications. Your pick up from the airport, your travel for the wedding functions and your drop back to the airport would be looked after the bride and her family. You would not be expected to make transportation arrangements. Carry these JBL Portable Speaker (Rs 4,699) to enjoy music while traveling for your bestie’s wedding and for the after party.